Hospitality establishments and entertainment venues are in a unique position today. Because the bulk of the customer experience exists in the real world for hospitality companies, hotels, restaurants, nightclubs, bars, and entertainment venues can make use of their physical spaces to attract, inform and entertain consumers. The key to engaging customers lies in three digital display technologies: Projectors, dvLED and large format displays. This guide to digital signage shows how these two technologies are changing the game for hospitality businesses. Hospitality companies have traditionally used poster board products to share promotions and announcements with their customers. While large paper signs may have sufficed when they were the only option available, large format screens and laser projectors now provide more versatile and engaging solutions. Due to manual wear-and-tear and the elements — or the information on it rapidly becoming outdated — paper signage hasn’t always been a reliable or practical way to communicate with hospitality patrons. 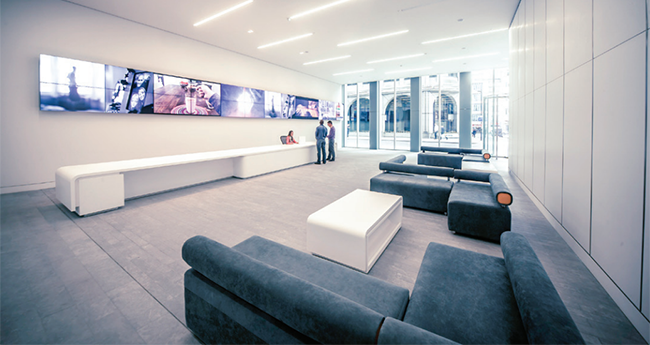 Digital signage in the form of commercial dvLED and LCD displays, however, is changing that. Digital signage enables hospitality establishments to transform wall space into something larger and much more engaging and informative. They can present a wide variety of content on these screens, ranging from branded promotions and interactive social media challenges to instant travel alerts, up-to-date menu content and upcoming specials. And because they sit on a digital display instead of a piece of paper, messages can be updated in real time. The interior and exterior of hospitality venues are filled with surfaces suitable for projected images. Projectors can transform these surfaces to create an eye-catching, captivating and customizable experience for customers. Projection has become an attractive option for many businesses because laser projectors are simply a smarter choice than traditional lamp-based projectors. That’s because laser projectors are brighter, quieter, last longer and are easier to maintain. An exciting imaging technique, called projection mapping, enables hospitality establishments to go way beyond standard projection to transform spaces into something much more engaging. Laser projectors are particularly well-suited to map colors, images, videos, and even 3D content onto irregular surfaces, such as building exteriors and indoor spaces. • Display branded images or video content onto any wall for signage purposes. • Change the texture of a surface (for example, from transparent to opaque). • Share a broadcast of an event to keep visitors or customers entertained while they wait. • Mount a projector at an odd angle to shade a certain space with color. • Convert a lobby from a daytime atmosphere to one more fitting for nightlife. • Use edge blending to combine more than one projected image into a larger image. Hospitality venues stand to gain a lot from using new digital display technologies. Because of the highly unique way in which digital signage can be used, hospitality establishments can now change the typical everyday image or video into something truly engaging and extraordinary. Lightwerks can create a versatile and reliable audio visual solution that suits your unique needs and space. We specialize in digital signage, cloud-based conferencing, building security and high-quality audio-visual systems installation to improve efficiency, increase collaboration, and enhance presentations in your organization. Contact us at LightWerks today or fill out below form for more information on what we can do for your organization!